stayed at in Northern Thailand. stayed at this hotel in Bangkok. during the day and night. They even have one in New York. while listening to and watching the sea. Smells: Incense; street food (some pleasant, some not-so-pleasant). Sounds: The high-pitched whistle of the ferry boats in Bangkok. Suthep (in Chiang Mai - 30 baht); Mae Sa Elephant Camp; Opium Museum. shake; apple fruit shake; pad Thai with lobster. canoing through caves (about $100); snorkeling ($23 with boat ride to Phi Phi Islands). opium (sounds worse than it is); earrings and a ring; another pair of sunglasses. Street Food: Cut fruit; skewered things; mango with sticky rice; curries; crepes. Starbuck's; Au Bon Pain; Baskin Robbins; Dunkin' Donuts; Bud's Ice Cream of San Francisco; A&W. Type of currency? Thai Baht. $1 US is equal to about 36 baht. 'cheap'. 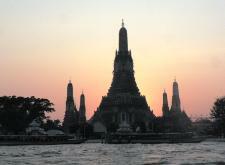 Hotels were also not very cheap in Bangkok and Phuket. tricks; having suffered major effects of the tsunami. in September 2006) is now the world's largest; there is a Thai Elvis in Phuket. 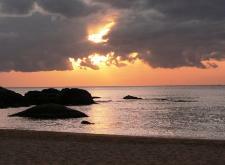 Sunset on Karon Beach in Phuket.